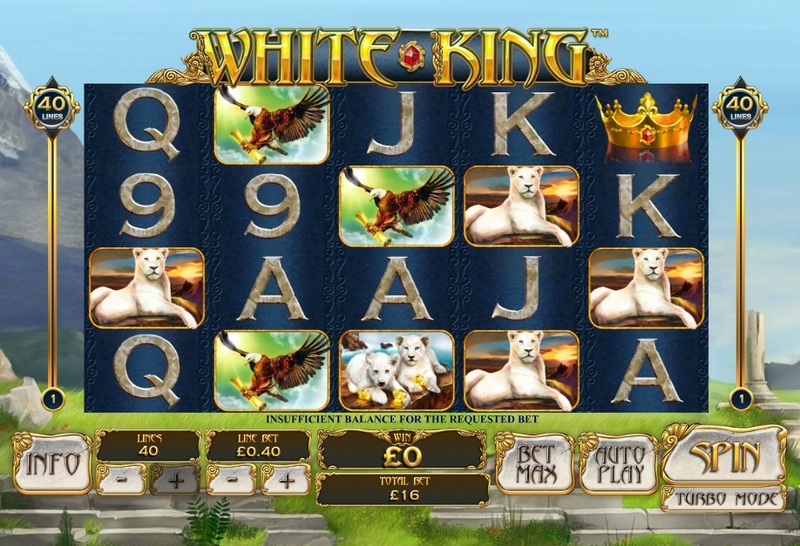 It has arguably been Playtech's most highly-anticipated slot release of 2014 but White King has finally hit the online slots market. It feels like yesterday that the video preview was launched on YouTube a couple of months back but now the real deal is here. White King is a 5 reel, 40 payline slot that focuses on the white lion breed of lion that can generally be found in the Timbavati region of South Africa that is close to the borders of Swaziland and Mozambique. Don't worry, if you don't know your African geography then feel free to Google that bad boy. If you do know your African geography then I tip my hat in your direction! The symbols on the reels consist of a number of different white lion variations such as a white lioness, white lion cubs, an eagle, and a crown. There are also the regular 9-through-to-Ace symbols across the reels. The White King Lives... and He is Wild! The White King himself acts as the Wild and he substitutes for all other symbols, except for the Scatters, to complete winning combinations and help you earn some big pay outs when these combination wins are triggered. The Scatters are represented by the White King Logo and these trigger the Majestic Night Free Games Bonus. You must hit three of these symbols on reels 2, 3 and 4 in order to trigger this bonus feature. You will initially be rewarded with 5 free spins but you can gain an additional 5 free spins if you hit three more White King Logo Scatters across the reels during the free spins. You can re-trigger the free spins up to 35 free spins. Notably, there is also a Stacked Wilds feature that pops up in the Majestic Night Free Games Bonus so even though the initial offering of 5 free spins might not be too appealing at first, the fact that these Stacked Wilds can come into play really ups the ante and gives the potential for some huge pay outs, particularly if you do manage to re-trigger the free spins. 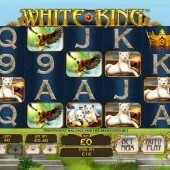 White King is a slot that has drawn a lot of excitement and it is easy to see why. The theme might not be the most awe-inspiring but the graphics are top notch and the Stacked Wilds feature really adds a lot to the free spins bonus round. I was starting to become a bit bored with Playtech slot releases and recent releases such as the football-themed Football Carnival slot and the Oriental Wu Long slot have been ok but not great. This slot has truly restored my faith in the old war horse developer and I can see this becoming a big hit over the coming months.